The appropriate tool from the tool library is assigned for the operation when it is created. The tool parameters can be modified on the <Tool> page of the parameters window. In the <Tool name> field there is the full tool list of the current group. When a new tool is selected from the database, all parameters in window are changed. On the Geometry panel is placed selected tool geometrical parameters. All basic insert parameters are shown on the <Insert> panel. These are the code, type, grade, geometrical parameters with the features considering of each inserts group. The insert that are compatible with the holder is shown by black color. Incompatible insert are gray. If the gray insert is selected then the holder is changed to the compatible ones. The <Custom> insert is compatible with any tool holder. 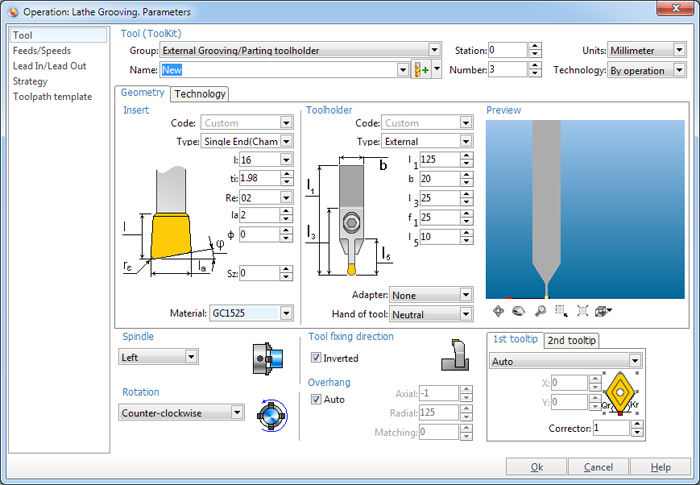 All basic parameters of the tool holder are shown on the <Holder panel>. These are the code, type, geometrical parameters with the group considering, hand of tool. There is the black and gray list like in the inserts list. The graphical window <Tool> shows the tool model with the defined parameters. Visualization control is performed like in the main graphical view. <Tool fixing direction> – this parameter controls how the tool is fixed in the holder. There are two possible values: direct and inverted. <Overhang> allow define tool overhang from the machine magazine. Overhang value is divide on the three types: <Axial>, <Radial>, <Machining>. The tool path is calculated for the <Tooling>. The <By default> button reset all parameters to the default values of the current operation. The tool number and tool station are defined in the corresponding fields. These numbers will appears in the NC program. If the required tool is not found in the current tool library then it is possible to edit it or to choose another library. For the tools library control it is necessary use button which placed after Name field. The picture on the button is show the active library control action. To take the all possible control function list it is necessary popup the list. If the operation tools kit have no necessary tools then tools can be copy from other base. 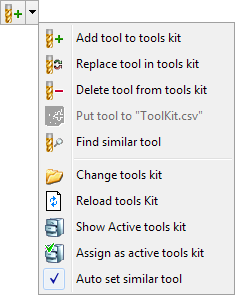 Open donor tools kit select tool and run function <Put tool to "Toolkit.csv">. As result selected tool will be add to the operation tools kit. After coping all tools it is necessary use Show Active tools kit function to reopen operation tools kit. On the <Technology> page is placed technological tools parameters. Panel <Cutting Direction> allow to define the optimal cutting directions. <Axial> is distance from machine marazine zero pos to tool end point along tool axis direction. Panel <Roughness> allow define result surface quality. The value is influence on the cutting regimes. If it is necessary the parameters can be corrected in the semi-auto mode. 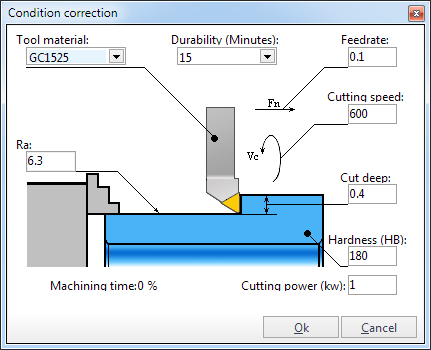 It is necessary press <Condition correction> button to the open cutting regime correction window. 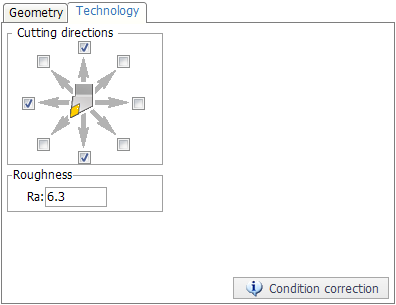 The window allow select the limiting parameter and to make parameters correction by it.